Cinco de Mayo; the 5th of May..... Using our Volkswagen Eurovan, my wife Marty and I along with our Chesapeake Bay Retriever "Shogun" drove from Colorado to Northern Wyoming under endless blue skies until we were about an hour's drive South of the 1100 foot high Devil's Tower..... As we approached; the skies darkened and the winds blew fast moving clouds across the summit. The last time I climbed the Tower was in 1990 under similar stormy conditions. My partner at that time; Michael St. Zinsley and I ended up climbing in a thunder and lightning storm that helped develop the personal courage to start projects under difficult conditions. 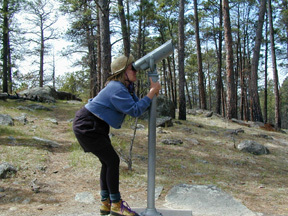 I hoped that once was enough for this Lesson and that it would be fair weather for the climb. The next day was clear and the forecast was for two days of cool and sunny weather followed by rain. My current partner Richard Cunningham and I decided to take a day to "Make Friends" with whatever Gods and Spirits exerted an influence on this Sacred area. I used an Olympus digital camera to capture the image on the right from a painting hanging on the wall of the Devil's Tower visitor's center. On the surface, this painting Communicates the legend of a Bear chasing seven maidens. The Great Spirit decides to help the maidens by having a tree stump they are standing on grow to gigantic proportions so that the Bear can not reach them. 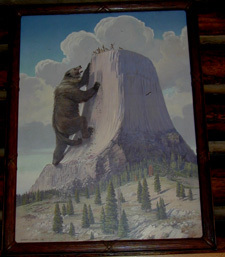 As the Bear reaches higher for the maidens, the Devil's Tower grows higher and the claws of the Bear dig deep grooves in the sides of the monolith that can still be seen today. As the Tower grows higher, so does the Bear until a point is reached where the Great Spirit throws the maidens up into the Sky to save them; turning the maidens into the seven stars of the Pleiades constellation. The Bear is also thrown up into the sky as the constellation Ursus Major..... the "Great Bear". 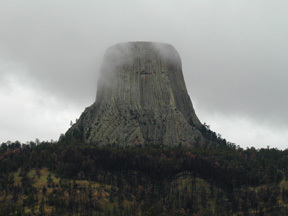 From the visitor's center we began to walk around the tower on the 1.3 mile paved trail that never goes far from the base of the monolith. In the previous image you can see the relatively narrow East prow of the Tower. 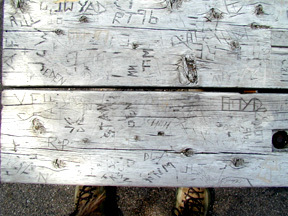 Along the trail were wooden benches carved with the initials of visitors along with permanent observation binoculars that people were welcome to use to get a closer look at the climbers. The next day was clear and cool so we pulled out our climbing gear and headed for the base of the climb. We decided on skipping the fourth class ramp on the substructure of the monolith traditionally used to start the climb by using an off width crack system as a direct start to the Durrance route. This would add two more pitches to the climb and raise the overall rating to YDS 5.8 or so. On the third pitch I used our Olympus digital camera's ability to capture an image of Richard making the moves into a chimney. 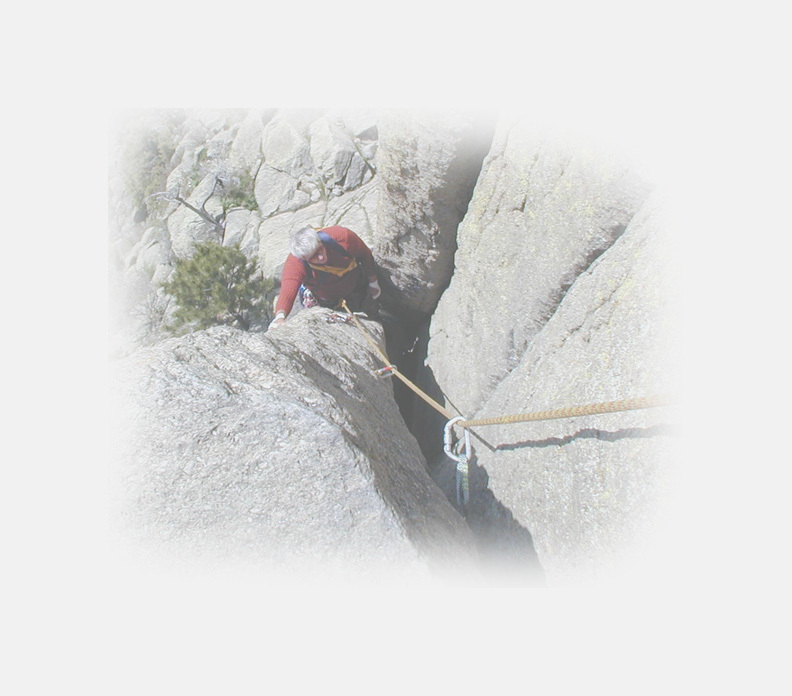 I used a still image of this section of the climb as the background for this Webcast. One of the interesting things we had Learned from 25 years of technical rock climbing was that the physical and mental gymnastics of the climb encouraged the human mind to increase the number of connections between the left and right hemispheres. After years of climbing; we started to use both sides of the mind equally to solve the problems the routes offered..... We were in mental Balance. This mental Balance was not only encouraged; but necessary to solve some of the challenges of the higher levels of climbing. The more your mind was in Balance; the harder the routes you could do..... The harder the routes you did; the more the mind was encouraged to increase the connections between the left and right hemispheres. 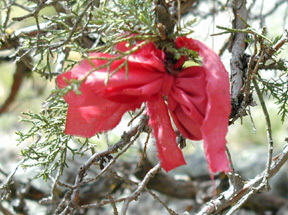 From where we were I could look down and see a Juniper tree filled with colorful red Prayer flags tied to the branches. Those who are Shaman send Prayers to the Spirits who influence this Sacred area as the flags flutter in the wind. Many of the flags had words like "Mom", "Grampa" or "Peggy" written on them to emphasize who the Prayer was for. This is a form of symbolic Magick used by some of us to help people move toward Wellness. As an Engineer and Roman Catholic Theologian I had exposed myself to the Shamanic traditions. Over the years I discovered some of the parallels between Shamanism and technical climbing. One of the more interesting parallels was the use of mental acceleration in problem solving. The Shaman would "Listen" to the problems of his or her Community and then by retreating to a Sacred place and entering a state of accelerated mentality the Shaman would be able to accomplish years of "Thinking" in just a few hours or days. When the Shaman realized the solution to the Community's problems he or she would leave the Sacred place and Communicate the solution to the people of his or her Community. This same sort of accelerated mentality or Ecstasy can be invoked by the demands of technical climbing. Months or years of "Thinking" can be accomplished in a few hours or days. The solutions to Engineering or Community related challenges can be realized in a much shorter period of time than conventional approaches to problem solving. For both the Shaman and the Alpinist; ADRENALINE provides the energy for the mental acceleration of a mind in Balance. The mental acceleration that is perceived as a slowing down of external events has been experienced by many people during a crisis situation such as an automobile accident. It is the prolonged and purposeful invocation of this phenomenon that distinguishes the Shaman from the other members of the Community. The same type of experience is mentioned in the Christian spiritual traditions. Remember for example the story of the prophet Moses climbing a route on Mount Sinai. After making the ascent; Moses came down from the summit able to Communicate a set of Divine laws that structured society now known as the Ten Commandments. 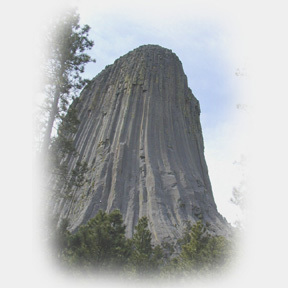 The image above is an aerial view of the Devil's Tower that shows our climbing route along the right edge of the monolith. 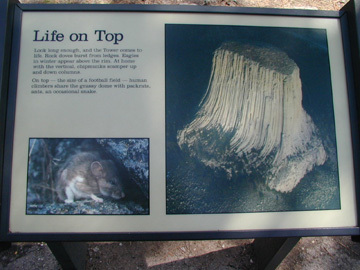 In the center of the grassy and flower covered summit there is a wooden sign that says "No Climbing Above This Point". That is all of the tale we have time to tell today..... Come back and visit again to hear more about our attempt to "Reach Up And Touch The Sky".